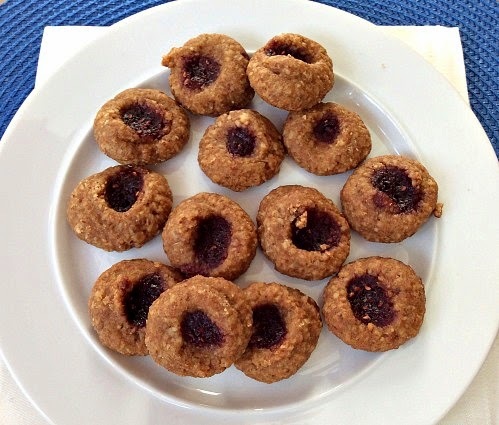 This versatile and easy recipe for a "GF/DF and Grain Free Thumbprint Cookies" could not be simpler or yummier! Switch things up by using several different jams or jellies. These are really delicious and have become a tradition for my family. Thick fruit preserves, for the filling Note: I used raspberry preserves for mine. In a medium-sized bowl, whisk the almond flour, baking soda, and salt together. In the bowl of your mixer, beat the melted coconut oil, maple syrup, and vanilla together until smooth. Add the dry ingredients and beat until the ingredients are thoroughly combined. Preheat your oven to 350°F. Form the dough into one tablespoon-sized scoops and roll them into balls using your hands. Place the balls onto a lightly greased baking sheet and slightly flatten them. Using your thumb, press into each cookie leaving a thumbprint in the center. Add a small amount of jam or other filling in the center of each cookie. Bake for 8-10 minutes or until the cookies begin to brown along edges. Allow the cookies to cool on the baking sheet for about 5 minutes. Then transfer them to a wire rack to cool completely. These thumbprint cookies are best served the same day because almond flour tends to soften quickly. Yum - I keep buying almond flour but haven't actually baked anything with it yet. Gonna have to try these cookies! Thanks so much for stopping by and enjoy the cookies! I recently discovered thumbprint cookies and I'm pretty sure they're a new fav. ;) Thanks for sharing these at Savoring Saturdays! Thanks Raia and thanks again for stopping by! These look awesome! Thanks for linking up to Savoring Saturdays! Thanks Eva for stopping by! Enjoy the weekend!